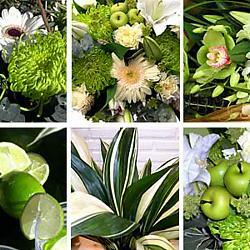 Green Carnation flowers are contained in the following bouquets which are available for next day delivery in the UK. Green Carnations are perfect if you're seeking something slightly unusual, a bit out of the ordinary. One of the most popular uses for green carnations is its use as a decorative addition to lapels on St. Patrick's Day. Broadly speaking, the carnation is the birth flower for the month of January, so if you've a loved one celebrating a birthday during this month a bouquet with green carnations is relevant. Here's an interesting bit of trivia: it's thought that the name carnation is derived from the Latin word incarnation, referring to the incarnation of God. Religious connotations also abound in the stem's scientific name: Dianthus, or flower of the gods.